Rinse and drain the Brussel Sprouts. Cut the stem off of each one then cut in half. In a cast iron skillet, coat the bottom with Olive Oil and a generous amount of Salt and Black Pepper. Then place each halved Sprout face down in the bottom of the skillet. Turn heat on the medium-high. 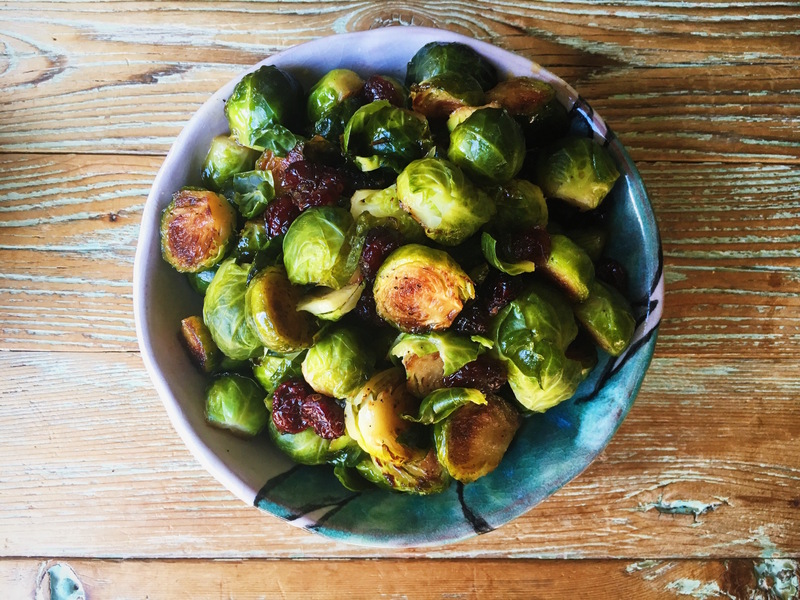 Let the Brussel Sprouts cook until the bottoms are golden brown and crispy. Add about an 1/8 Cup of water and cover for another 2 minutes. This creates a steaming effect that will soften the Sprouts, but don't worry the bottoms will remain crispy! Remove from heat and pour the Maple Syrup over the tops and add the Cranberries. Keep covered until you are ready to serve!